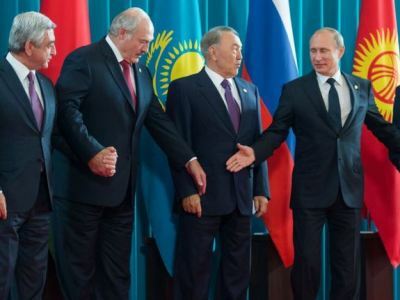 The leaders of the Eurasian Economic Union (EAEU), including Kyrgyzstan, signed the Customs Code of the Union on Monday. Chairman of the Eurasian Economic Commission Board, Tigran Sargsyan, said the aforementioned after the Supreme Eurasian Economic Council session held at presidential level on Monday, RIA Novosti reports. He earlier informed that three countries signed the Customs Code except for Kyrgyzstan. “The presidents of four countries signed all the presented documents, including the Customs Code,” Sargsyan told reporters, adding that the document significantly facilitates all the customs procedures within the EAUE states. He also added that Kyrgyzstan, which didn’t put its signature during the signing ceremony, approved it at the end. “Kyrgyzstan signed the Customs Code. The Kyrgyz side hasn’t signed only the statement on how we will organize our foreign economic activity. This has to do with the fact that our Kyrgyz colleagues propose to ascertain the formulation regarding the removal of obstacles and restrictions in the domestic marker,” he noted.